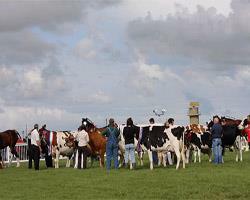 The Anglesey County Show is held each summer across the A5 road from Mona Airfield. North Wales premier agricultural event features competitive classes for shire/light horses, cattle, sheep, pigs, goats, fur and feather, horticulture, cookery and crafts. The 160 acre show ground will have 350 trade stands, 1000 show horses and show jumping horses and will expect 55,000 visitors.